Seafood processing businesses in Alaska are feeling the hurt from the U.S.-China tariff battle, according to the results of a survey from the Alaska Seafood Marketing Institute. Fourteen Alaska seafood processors responded to the survey, and 65 percent of those reported lost sales due to tariffs in China. Half of respondents reported delays in sales, and 36 percent reported lost customers. “Those are significant numbers,” said Jeremy Woodrow, communications director for ASMI, the state’s official marketing arm for the industry. It’s not so easy to just sell product affected by the tariffs somewhere else, either, he said, because of how long Alaska has been an established presence in the Chinese market. 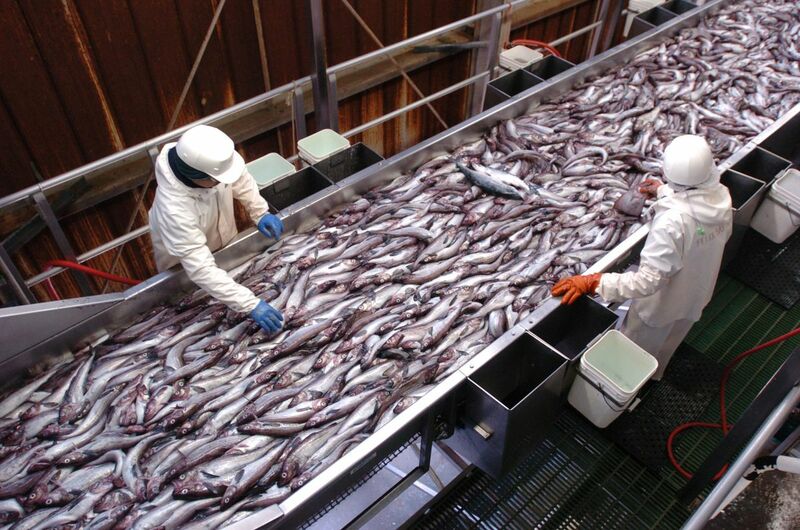 There are hundreds of companies that process Alaska seafood, but many deal with small volumes. The 14 processors ASMI surveyed process “a significant majority” of the state’s total annual seafood harvest, Woodrow said. He wouldn’t say which companies answered the survey. China is Alaska’s biggest market for seafood exports, and some of the fish that gets harvested here goes to China for reprocessing before getting imported back to the U.S. China is a growing domestic market, too, said Woodrow. There was another tariff hike set for March 1 on goods from China to the U.S., but it was delayed, Reuters reported earlier this month. Most major Alaska seafood products have been subject to the tariffs, including frozen salmon, pollock, cod, crab and scallops. Some types of salmon and other products have been exempt. The estimated volume of Alaska seafood exported to China fell by roughly 22 percent from 2017 to 2018, said Garrett Evridge, an economist with Anchorage consulting firm the McDowell Group. The estimated value also fell from about $980 million to about $780 million, or about 20 percent, he said. Those figures were based on trade data from the U.S. Census Bureau. However, he said, there are several factors that contribute to that change, not just the tariff situation with China. Also at play is a lower pink salmon harvest last year, and a lower harvest for Pacific cod. A 20 percent change in volume and value in one year also “is not unprecedented,” he said. Woodrow brought up the impact of the U.S.-China tariffs in a presentation to the Alaska Legislature’s House Fisheries Committee at the end of February. In the long term, the tariff on seafood imports from China to the U.S. “could slow U.S. consumption of our own seafood because prices could increase,” the presentation said. Companies may eventually look elsewhere for reprocessing, it said.